Before proceeding, let me say that I have had the utmost respect and support for Liz as the 18th Legislative District Representative. She is not involved in this write-in effort, as she has claimed, even though she did file as a write-in candidate. I wish she were as perhaps this unvetted claim being made against Democrat Mike Dalesandro would not be out there. I also pray her allowing Christian Berrigan to use her as he is does not do her irreparable harm politically in the future, but that is well beyond my pay grade. I am equally certain this post will bring out the hotheads manipulating and controlling the RPCCGOP and I will be accused of supporting Dalesandro. That too is not accurate as I maintain I neither support nor oppose candidates this election. I am equally certain some Democrats will not appreciate seeing the information either. In ads, facebook posts and comments we frequently see claims of Mike supported the CRC light rail project and is no different than Marc Boldt. Undoubtedly there may be some similarities, but don’t we find that with every political candidate, they tend to agree on some matters and not others? I’ve known Mike for a few years now and met him after beating him to a pulp in his first run for Battle Ground City Council back in 2009. While I wouldn’t say we are close buddies, we have had several friendly exchanges on issues we disagree on and have come to agree on some other issues. Let’s just describe it as an example of that bipartisanship voters continue to claim they desire seeing to cut through political grid lock paralyzing the country at all level. 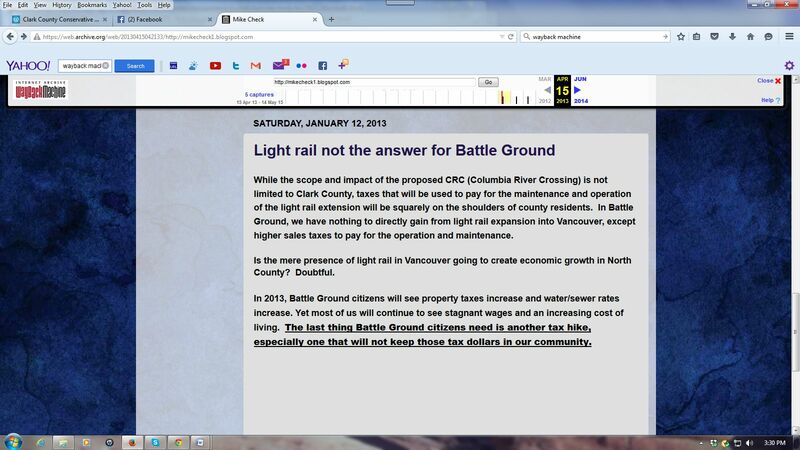 The CRC light rail project is one of those issues he and I disagreed on, I opposed it and he supported it. I do recall reading that post on his old blog. Clearly, based on his comments to me, Mike came to agree with many of our views in opposing the CRC as then designed, the need for more river crossings and the voters getting a clean up or down vote on the project that we never received. To further support this, I did a WayBack Machine check today for Mike’s old blog and found some of it captured. I offer screen shots recovered just today of but two posts he made back then against the CRC and how it would not have been of any benefit to Battle Ground. 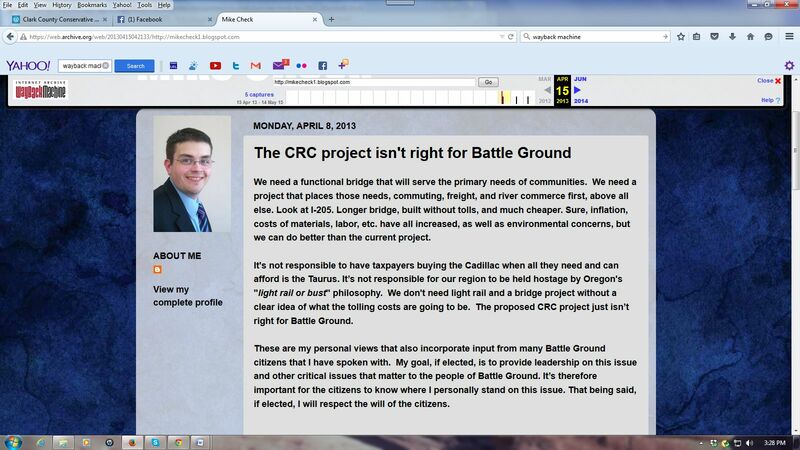 I do recall Mike writing other posts in opposition to the CRC, but apparently the WayBack Machine did not capture them. And yes, earlier he did write in support of the project, but as has been shown, did come to see it just wasn’t the right project for this region. Had Madore, Berrigan or any of the others spreading this claim made the slightest effort to vet the claims they should have easily found the same things I did and I likely would have shared what I have saved from years past, having numerous times let it be known that I save many old articles and comments on controversial issues such as the CRC. No, I don’t have everything, I’m only human, but I do retain a lot for reference for my blogging. As for where will Mike stand on future efforts to breathe new life into a CRC-like project, I truly have no idea, we haven’t discussed that. But it is also known to be a project in disfavor with a lot of citizens in the county, especially if light rail once again becomes the prominent factor. And again, this is not presented as a means to support any campaign, but it is apparent that be it David Madore or Christian Berrigan, neither learned anything back in the 2012 campaigns. I urge you all to not just accept claims blindly made by any candidate with researching them on your own. I also urge you all to make your voice heard and vote. But vote with the truthful knowledge of who or what you are voting for. Update Oct. 1, 2015: It saddens me to see after this post was posted, the Write-in Liz Pike PAC released an ad stating “Dalesandro supports $8 tolls.” Currently, even though efforts have been made to reengage interstate discussions on a new bridge, there is no actual project, with or without tolls on the table. Even Madore’s East County Bridge is not being discussed currently. It seems the far right group now in charge of the RPCCGOP has little use for honesty in campaigning. Just out of curiosity, has he come out swinging against it lately? Has he come up with any solutions to our cross river transportation issues at all? Does he acknowledge that the solution is not the “replace the I-5 Bridge” now meme of the average leftist? Has he come out in support of any other option? Because I have to wonder: how much of his late “come to Jesus” stance was driven by the political landscape, and how much of it is genuine? And where is he now? At the very end, it is stated I do not know his stance for the future. This merely deals with claims made that he supported it in the past and nobody vetting that claim. In March of 2012, the political landscape was still favoring the CRC as we were strongly fighting it. Well done. Liz IS dirty in this, though, Lew. I haven’t heard anything out of Liz, so I won’t make any claims against her. I do wish she had approached this whole issue entirely different, though. This whole matter reeks of Christian Berrigan. annrivers18 – Liz IS dirty in this, though. Liz is forbidden by law from participating in the campaign because it is an independent committee. Why are you so quick to condemn Liz? Do you have a financial interest in legislation that one of her opponents will promote? Not answering for Ann, but this is also why I say I wish she had approached it differently. Since she is forbidden by law from interacting with the PAC, when we hear of positions, are they hers or Christian Berrigan’s? The democrat party in Clark County has supported the CRC with light rail. These screen shots are comments limited to Battle Ground. The democrat county commissioner most recently in office for several terms was a rabid CRC with light rail supporter. He pushed the ballot measure for it in 2012, with his wife paid to raise $ for the PAC pushing it. When the voters said NO to light rail at the ballot box, the democrat county commissioner led the charge to change the CTRAN policy that prohibited CTRAN sales tax funds from being spent on light rail, then pushed through a contract for light rail services with TriMet, a contract that remains in tact. Haven’t heard Delesandro denounce the contract for voter-rejected light rail yet. (If I missed it, please update here). Is Delesandro honoring the two votes AGAINST BRT, the first in 2012, and the second county-wide in 2013? The CTRAN rep from Battle Ground keeps voting for voter-rejected BRT in Vancouver, which only takes away funding for transit in the rest of the county. You’re grasping at straws, Margaret, just as you did with the Boldt robo-call. As I recall, our effort then was to change minds and now, when presented with evidence of doing just that, and with a Democrat no less, it is condemned? There is no need to obfuscate the issue of y’all making claims that are not vetted for accuracy by dragging in other issues. As for the screen shots, yes they address Battle Ground, but there were others, as stated, that WayBack did not capture. And again, this is not to support or oppose any candidate, but it is about honesty and integrity, sorely lacking in too many campaigns today. While Steve Stuart, the democrat pushed for light rail not all democrats were for it. So just because he was and many others as well does not mean that Delasandro didn’t have his own developing opinion. Over the years we saw Marc Boldt have his opinion of the project transition. Starting with an open mind people often look at something and think it might be okay. As time goes by it eventually becomes clear and they vocalize a different position, one of opposition. That happened a lot with the CRC project. We should all be glad frankly that they are willing to consider something and that they are willing to alter their stance when it becomes apparent to them how bad something could be. This group is being dirty Lew. They are posting all kinds of ugly lies regarding Boldt as well. I am reading on Facebook and finding them calling him a Democrat. What right do they have to decide a Republican PCO is a Democrat? They are filled with crooked power hungry schemes. Liz can campaign, she should campaign if she is letting them use her name. The law says she cannot co-ordinate with them but it does not say she cannot campaign on her own. Furthermore she sent out an email saying “did you see my ads” so I say she is in violation if the tv ads aren’t really her ads but the pac ads. Her lack of doing so shows this reader her true intentions are to let this group tell the whole of Clark County who’s the boss. I find this whole thing corrupt. By the way did you see the pdc report? The write-in pac shows $27,500 from David Madore. The second largest donor is the infamous Chuck Miller, then Anna Miller and Kevin VanGelder. The pac has reported $28,000 in Donations thus far and is spending how much on television ads and signs? Something smelly this way blows! I’m not supporting Boldt, or any for that matter, even though I was accused of loyalty to Marc by informing people that the robocall was from voice mail and some was cut off, but in my comment of “look before you leap,” I also just happen to have audio of some radio interviews Marc did back in 2011 and 2012. Great piece Lew! . . .maybe Delansandro is a thoughtful person who has the ability to change his mind when presented with facts, hmmm. Guess I will give him a better look, I am at a loss over who to support anyway. The question is, if Mike’s blog is truthful and his position is like the blog, why haven’t the democrats (i.e. Jim Moeller,etc) blasted Dalesandro. I seem to recall Jon Haugen couldn’t get the nomination because Moeller said he wasn’t a “real democrat” because of the CRC even though he was the only Democrat to challenge JHB. It’s like with Nelson when he said not all R’s opposed the charter, he could had applied that to the CRC. That I recall he did face the scorn of some then. I doubt Moeller was interested since he was a small player then in local politics and wasn’t running for office. That came about later. My guess now is that Moeller is as unaware of Mike change of attitude then as many others are too. I also seem to be very confused as I thought our effort back then was to change minds and draw people to our point of view. But it seems pointing out success in that area is condemned as well. I would love to hear Mike’s stance on light rail now. I sent email yesterday and have not heard back yet. So if we elect Marc we know we will be getting light rail if it comes down to it. Mike has no current response. If we elect Liz we know she will do everything in her power to keep light rail from crossing the river. While I have no doubt light rail will be back in play, it is no currently part of any plan. I’ll also ask you to please refrain from advocating voting for anybody as this blog is not supporting or opposing candidates. Information I provide is just that, information, not campaigning. Questionable claims are being made by those claiming to be “Christian” that are not very honest. I’m surprised that in this toxic political environment anyone can have an open mind and engage a willingness to change their opinion on such an important local issue. Kudos to Mike D for that anyway. I guess we’ll have to wait on him to state his current view on bridge, light rail, etc.